This page lists different ways to take action against ACTA right now and to learn more about this dangerous agreement. v · d · m The European Parliament rejected ACTA by a huge majority, today Wednesday 4th of July. Now, it is time to start a positive reform of copyright to adapt it to the digital era. In this regard, La Quadrature du Net's platform of proposals provides a thorough analysis of the key stakes and a consistent set of proposals, for the copyright reform as well as related culture and media policy issues. To ensure further victories and continued action, please support La Quadrature, by making a donation or by helping out. 2 minutes video on ACTA. To be informed about the next steps to urge Members of the European Parliament to reject ACTA, send a blank email to NOtoACTA-subscribe@laquadrature.net to subscribe to our list. To discuss ACTA, subscribe to our discussion list by sending a blank email to acta-subscribe@laquadrature.net. We won't use your email for anything else. ACTA is a multi-lateral trade agreement which threatens to change the Internet as we know it and puts fundamental freedoms at risk. The European Parliament will vote on ACTA this Wednesday July 4th and has the occasion to reject it once and for all. You will find on this page different ways you can act to defeat ACTA as a citizen. helping spread the word about ACTA. Contacting your Elected Representatives is the most useful thing you can do right until the wednesday's final vote in the European Parliament, last step of the procedure. To easily get in touch with the right Members of the European Parliament, you can use our PiPhone. This tool will connected to a Elected Representatives free of charge. If you enter your country, you will be connected to an MEP speaking your language. If you need it, an example of call and the user guide are available. You also can use Political Memory to get the contact details of a precise MEP. All MEPs will vote during the plenary session of July 4th, but it is more useful to contact first and foremost the members of the EPP, of the ECR, of the EFD, of the ALDE (except Italian, French and Dutch), of the S&D (only Spanish, British, and Portuguese), and the non-attached (NI). Key arguments are listed on our page ACTA: to keep in mind. The MEPs have been given a “fact-sheet” on ACTA's supposed inoffensiveness to reassure concerned citizens (that's you). You can find a debunking of these lies here. If a question to which you don't have the answer comes up, don't panic. You are not expected to be an expert, only a concerned citizen. Tell the MEP you will research the answer and call back with more information, and come and ask us. If you're still not comfortable with the arguments, don't give up. Ask what is the MEP's position on ACTA, and ask what are their arguments. During your calls, you will speak most of the time to a Parliamentary assistant. They are generally polite and intelligent people, approach them accordingly. Being calm and courteous, tell them about your concerns, asking them to take part in the parliamentary debates and to take a stand against ACTA. Don't forget to let us a little feedback of your call, either on the PiPhone, or by contacting us. That's very useful for us. In general, don't hesitate to offer to call back with more information, to meet the MEP, to send documents, references, etc. Sometimes, Parliamentary assistants will ask you to send an e-mail. Don't hesitate to call back later to check if they've read it and what they thought of it. Another important and complimentary way to act against ACTA is to inform people, making sure as many people as possible know about ACTA and how bad it is. It may sound obvious, but people can only want to act against ACTA if they are aware of its dangers. Spread the ACTA dossier and refer people to it for more info. Or go to this page to find the code to embed other versions of the video in English, and to this page to embed versions in French. You can also use the embed links from Youtube and Dailymotion to spread the videos. 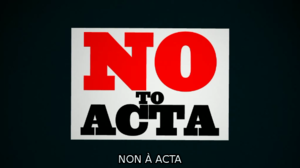 Use our No to ACTA flyer for demonstrations, informative actions, and share it, remix it and help translate it! Creating more creative bits and art and expressing oneself is another powerful way to inform other people. The power of image and creativity to explain and touch people is very strong, so this is a great way to act against ACTA if you enjoy writing, drawing, painting, making music, etc. For instance, you can create banners, buttons, illustrations against ACTA (using images from the videos if you want) that others can use in their signatures, as avatars, to illustrate their blog articles, newspaper articles, etc. If you do so, please post a link to your banner here. Remix and transform already produced material, and give it a new life. For instance, to the right here is a cool infographics remix of the NO to ACTA video with RoboCopyright ACTA. Organise public events at your school, university, work place, etc. 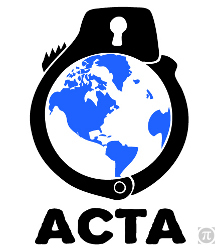 If you are part of an NGO, consider having it publicly denounce ACTA, and telling your members about ACTA's dangers. Contact well-known persons, celebrities or NGOs and ask them to take a stand. If you can afford it, financial support is of course greatly appreciated. You can make a donation to help La Quadrature keep on fighting ACTA and act on the other dossiers it works on. To help other people from different parts of the world act against ACTA, you can help translate this page. Remember to always use the English version as the source for your translation, as it is the most up to date version. If you do so, remember to update the translated version often enough. Once translated, create a new page on the wiki with your translated text, and add a link to your language to the top of this page. Together, we can do amazing things! Like defeat ACTA! This page was last edited on 26 June 2012, at 19:33.